The biggest day of your life can move pretty fast, we're here to make sure that you don't miss any of it. We don't just document your wedding, we make a spectacle out of it. Remember, it's not a wedding video, it's a wedding movie! Below are a few examples of the types of films we produce. From big productions to small, we guarantee a wedding film that you'll want to watch over and over again. At Get Hitched Films, we believe everyone deserves a beautiful wedding film that they can watch for years to come. 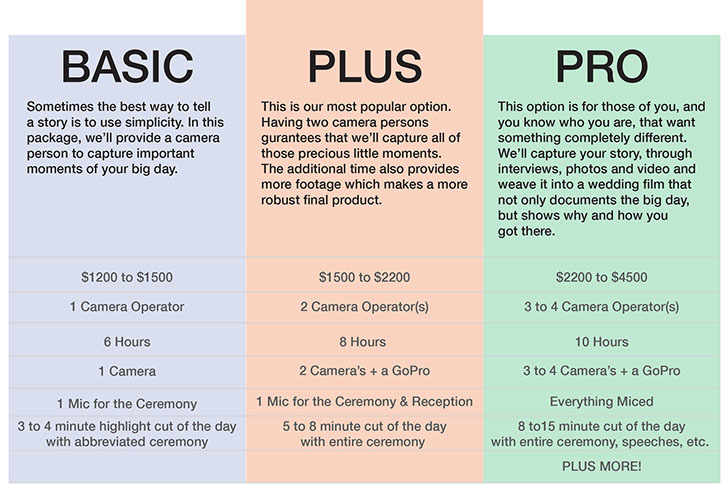 Because of this, we'll work with your budget to bring you the best possible wedding film we can produce. To give you a better idea of how we price our videos, you can refer to the graphic below. Please take note that these are not set packages and can be modified, based on what you're looking for. Not sure what you're looking for? Give us a call and we'll help plan out your wedding film for you. We also film engagement videos, destination weddings and can consult you on how best to make your own honeymoon video. Get Hitched Films now offers live streaming of your wedding. Now anyone can experience your big day with you, regardless of where you are! We will be offering 360 videos. This new and immersive experience will make you feel like you are actually at the wedding! We also offer discount pricing for weddings taking place between December 1st and March 1st. Get Hitched Films is a tight-nit group of professional filmmakers that decided to band together to help soon-to-be newlyweds get a professional wedding film that fits within their budget. We do not hire out our filmmakers. Although there are a few of us, we can always guarantee that our best person will be behind the camera. We will work with you to find the type of film you want, for the price that works best for you. If you have ideas for your film, we'd love to hear them. We're always excited to try something new and exciting. If you're interested in hiring Get Hitched Films to document your big day. Drop us a line.